(Bloomberg) -- Thailand’s military establishment is intensifying attacks on a young political party that surged in March’s general election and whose 40-year-old leader is the newest symbol of opposition to the junta. The party, Future Forward, won about 18 percent of votes and is a key part of a coalition trying to prevent the junta’s proxies from forming the next government. The party’s supporters say the military administration is trying to cow opponents and blunt the anti-junta alliance to retain power. Thaksin-linked parties prevailed in every election held since 2001, only to be unseated from government by coups or the courts. He remains a divisive figure in Thailand, where he faces jail time for a conviction in a corruption case he has called politically motivated. A junta-appointed Senate as well as the elected lower house will vote on who becomes prime minister, giving the military’s allies the upper hand. Another party linked to Thaksin was disbanded ahead of the election for nominating a Thai princess as its prime ministerial candidate, an act deemed hostile to the constitutional monarchy. 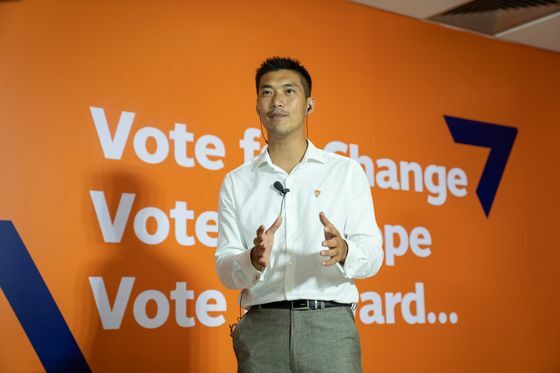 Thanathorn used a savvy social-media campaign to help build the party’s following, and some supporters even call him “Daddy.” His key message is ending army rule, rewriting the military-drafted constitution and preventing future coups. The party, formed in March 2018, placed third in terms of votes and projected parliamentary seats. Its other major policies include giving regional governments more control over spending, and breaking up entrenched oligopolies.